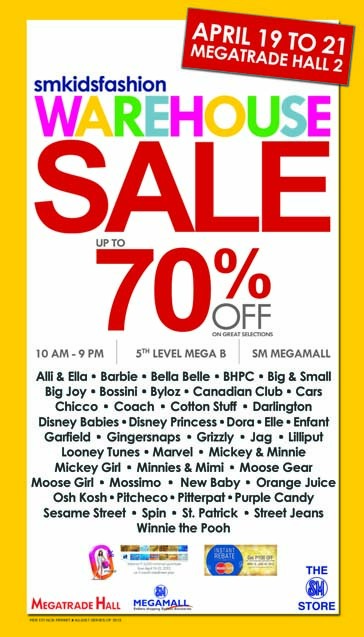 Brew of The Day: Sale Alert - SM Kids Fashion Warehouse Sale up to 70% Off! Sale Alert - SM Kids Fashion Warehouse Sale up to 70% Off! Hey Coffeeholics! Its definitely going to be a wonderful summer with these Super Summer Offers at the SM Kids' Fashion Warehouse Sale on April 19 to 21 at Megatrade Hall B, SM Megamall. Metro Manila, Philippines – Prices go down as the temperature goes up at the SM Kids’ Fashion Warehouse Sale. Youngsters can indulge in season-worthy fashion at rock-bottom prices and stock up on outfits for school or play. Popular brands like Big & Small, Orange Juice, and Saint Patrick offer the latest in casual separates ideal for any activity. Winnie the Pooh, Barbie, and Mickey and Minnie tune in to their popular toon namesakes for a fun look that never fails to bring a smile to every face. From active wear to swimsuits and rompers, there’s definitely a wide range of clothes to choose from. Kid-friendly trends are now more accessible with special discounts from SM Kids’ Fashion. Customers can avail of 0% interest on select credit cards with a Php3,000 minimum purchase. Instant rebates of Php 1,000 are also available for MasterCard holders with a minimum single-receipt purchase of 3,000 from April 15-June 30, 2013. Indulge in fashion that knows no age at SM Kids’ Fashion Warehouse Sale from April 19 to 21 at Megatrade Hall B, SM Megamall. So don't forget to drop by SM Megamall this weekend! Happy Shopping! Mwah!